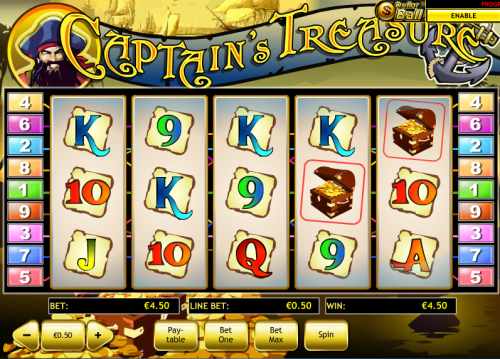 Weigh anchor and set sail for the high seas with the Captain’s Treasure online slot from Playtech; it’s a fast moving and entertaining slot which may lack a little in the graphical side of things compared to some newer releases but is well worth a small diversion. The era of high seas piracy and adventure on which this slot is based is an exciting one indeed; British, French, Dutch, Spanish and Portuguese fleets and privateers roamed the oceans striving for naval dominance. Characters such as Thomas Cavendish, Richard Hawkins and Sir Henry Morgan made names for themselves along with gigantic fortunes during this period and maybe you can get your hands on some of that loot too by spinning the reels of Captain’s Treasure. Playtech’s standard playing cards symbols are used here to represent the lower values while a ship’s wheel, an anchor, a treasure map and some cutlasses make up the higher values. 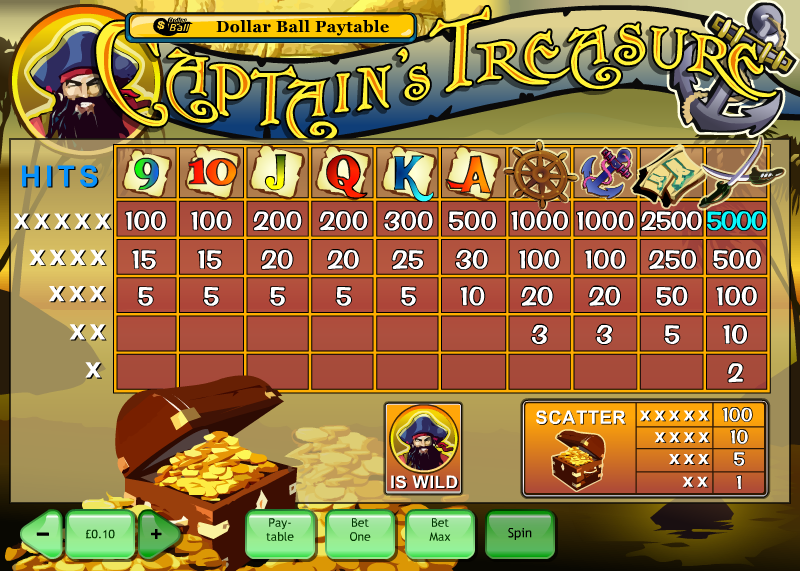 The captain himself is the wild card while the scatter symbol is a treasure chest. There are five reels and nine fixed paylines. It’s fair to say that this slot is one of Playtech’s simpler releases and as such it doesn’t really have a separate bonus game; the scatter symbols which would normally trigger one are just money winners if you are lucky enough to land them. As this is a Playtech slot it does feature their Dollar Ball feature which is linked to a progressive jackpot network. You will see the Dollar Ball feature in the top right hand corner and all you need to do is click the button to enable it. Landing five on the reels will win you the progressive jackpot while four, three, two or one will earn less. While this slot may not be for everyone because of its lack of bonus games and variety, there’s a certain attraction in it’s simplicity which should appeal to those who eschew the more complex offerings. A €0.01 minimum payline bet means a minimum spin bet of €0.09 with a maximum of €45.00.